China’s electric vehicle (EV) industry has been booming for nearly a decade, with generous subsidies from the Chinese government and state-sponsored marketing efforts. However, the research and development (R&D) subsidies are now shifting to vehicles with hydrogen fuel cells, a new technology that, according to industry, is cleaner and more efficient than lithium battery-run cars. Current EV automakers in China will have to face the cruel reality: The EV industry will soon suffer financial losses with the disappearance of state support. On March 26, China’s Ministry of Finance, Ministry of Science and Technology, and other agencies jointly announced changes to the subsidy program for lithium battery-powered electric cars, slashing subsidies by 67 percent. Electric cars with driving ranges of 400 kilometers (250 miles) and above will be cut by half, to 25,000 yuan ($3,700) per vehicle, from 50,000 yuan. And to qualify for any subsidy, electric cars need to have a range of at least 250 kilometers, compared with 150 kilometers previously. In addition, subsidies for EV vehicles will be phased out completely after 2020. Chinese Premier Li Keqiang’s visit to Japan in 2018 fundamentally changed his thinking about electric vehicles. Li visited Toyota Motor Corp.’s factory for manufacturing EV auto parts in Hokkaido on May 11, 2018, and saw a hydrogen fuel-cell vehicle called “MIRAI.” He learned that the MIRAI, which takes only three to four minutes to fuel, has a 650 kilometer (404 miles) driving range. According to several Chinese media reports, upon Li’s return to China, several ministries and commissions in China quickly assembled a team to develop hydrogen fuel-cell technology, the first signal that China’s policymakers would make the fuel cells a major R&D project. A lithium battery has several drawbacks when compared with a hydrogen fuel cell, which uses hydrogen gas as power. Lithium batteries contain heavy metals such as nickel, cobalt, and manganese, and the mining process to extract such metals can cause pollution to nearby water sources. Meanwhile, processing of copper, lithium, and other metals create toxic waste that, if not treated and recycled properly, can cause serious environmental problems. On March 15, China’s cabinet-like State Council publicized 83 amendments to its annual Government Work Report delivered before its rubber-stamp legislature. Among them was a provision to promote the construction of infrastructure related to electric and hydrogen fuel-cell technology. At the time, there were no additional policy details, but it was the first time that hydrogen fuel was included in the report. Eleven days later, the Chinese government announced the new EV subsidy policies. 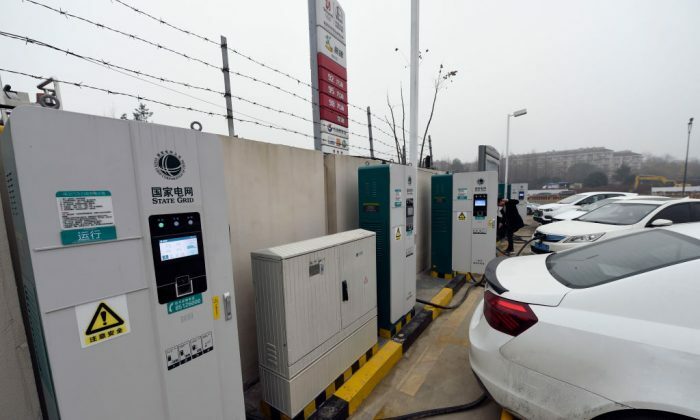 On April 11, the state-run, English-language newspaper China Daily reported that the central authorities’ development plan for hydrogen fuel technology set targets of getting 5,000 hydrogen energy vehicles on the road by 2020, 50,000 by 2025, and 1 million by 2030. China’s EV automakers are already losing money. For example, Chinese automaker BYD is a star brand in the domestic market. BYD started new energy vehicle (NEV) R&D 10 years ago. According to Chinese news portal Sohu, citing information from BYD’s financial reports, in the past five years, the company has received a total of 6.93 billion yuan ($1.03 billion) in electric vehicle subsidies from the Chinese regime. But the industry’s profitability was already falling. In BYD’s 2018 annual report released on March 27, the company’s net profit attributable to shareholders was 2.78 billion yuan, down 31.6 percent from the previous year. BYD explained that decline was mainly due to the reduction in subsidies and increases in R&D costs. In early March, NIO (known as Shanghai Weilai Automobile in Chinese), which specializes in making electric autonomous vehicles and became publicly listed only half a year ago, reported revenue of 4.951 billion yuan ($738 million) in 2018 while net losses were 9.639 billion yuan ($1.44 billion). In addition, NIO also announced that it would cancel plans to build a new plant in Shanghai. According to an October 2018 Morgan Stanley research report, NIO has been losing money year after year. The net loss in 2018 was 9.639 billion ($1.44 billion), almost double the figure from 2017. Total losses from 2016 to 2018 amounted to 17.233 billion yuan ($2.57 billion). The Chinese regime’s phasing out of EV subsidies could be devastating to the industry. The concept of new energy vehicles (NEV) has long existed. The Paris agreement adopted in 2015 has led many countries to transform in that direction. The Chinese regime took it as an opportunity to “surpass competitors by overtaking them at the curve,” hoping that NEVs would help China transform from a follower to a leader in the auto industry. In the Chinese regime’s 10-year economic blueprint “Made in China 2025,” released in 2015, NEVs were among the 10 high-tech sectors that Beijing targeted for aggressive development, so the country could emerge as a global tech manufacturing powerhouse. At the same time, the Chinese regime provided multiple incentives—subsidies to EV manufacturers; mandatory requirements for government agencies to purchase certain percentage of EVs; subsidies to auto consumers to buy EVs; and increased access to EV-only carpool lanes among them—all of which quickly propelled the growth of EV industry. China is now the global leader in making and buying electric cars. Morgan Stanley estimated that by 2020, China is expected to account for 59 percent of worldwide EV sales.